I would like to update you the progress and summary of our lunchbox initiative. Last year 2013 lunchbox initiative succeeded last month – with your support, we managed to provide lunches for 28 kids in Pa Nor primary school in Luang Prabang for the whole year. We grew vegetables ourselves with the kids taking responsibility to take care of their own vegetables. With your support, we included the tuition fees for those kids, provided some small money to the women who rotated to cook at the school. I visited the school at least once a month to monitor this initiative and do other village work. from the Royal project in Chiang Mai to teach the villagers how to grow flowers. 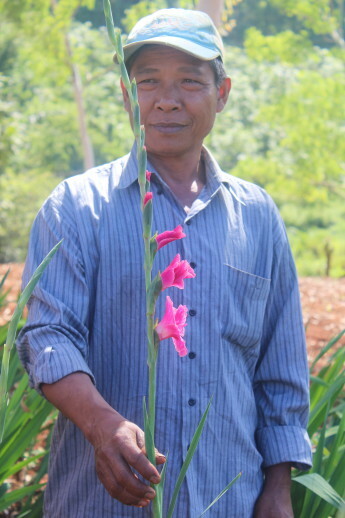 We planted five types of flowers with every single family involvement in half a hector piece of land. Three months passed, the villagers started to sell the first batch with a very good price. 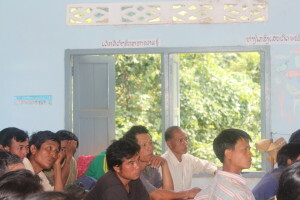 The experts went back there again in November to conduct a series of training and help build a nursery. The second batch was sold out with better quality and better price. The villagers are very happy. 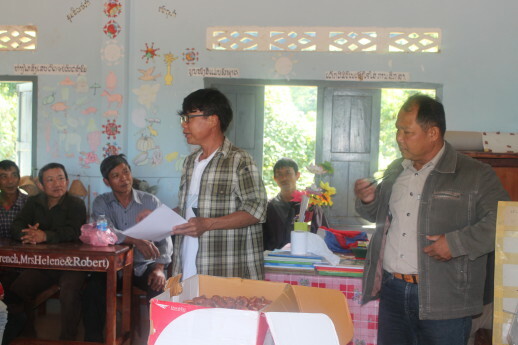 The villagers had a meeting and made a decision among themselves that the revenue they got from selling the flowers will be contributed to continue the lunchbox initiative for this year, as well as contribute to the next buys of seeds for their flowers. My father also contributed some money to start digging a fish pond to compliment this lunchbox initiative. We would like to thank you all of you for your support and inspiration you have given to me and our villagers. 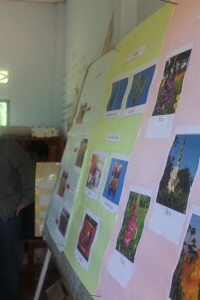 Those has written to me offering if they could continue support, I have responded that if you would like to continue support our village work, right now we are trying to raise some money (5,000 USD) to buy more seeds to plant more varieties of flowers this year. I and two experts from Royal Project Chiang Mai will be going to Luang Prabang soon for a meeting with the Village Committee and conducting another training. In two months, I have found a perfect partner who is a florist and we will open a first flower shop in Vientiane. So by July, we will likely have a shop to support buying flowers from our village and generate some revenues. Once again, thank you from the bottom of our heart. Please do write me if you would like more information. PS Some photos attached for the flowers work and lunchboxes initiative. Dieser Eintrag wurde veröffentlicht in Artikel, Ban Pa Nor und verschlagwortet mit Ban Pa Nor, bildung für kinder in laos, bildung für laos, bildung in Laos, Bildungshilfe, education for life, Entwicklungshilfe als Selbsthilfe, Entwicklungshilfe von unten, kinderhilfe, Kinderhilfe Laos, Laos, Luang Prabang, mekong, Schülerhilfe Laos, Schulhilfe Laos, Seminare fürs Leben, Spenden von Adolf Stoll. Permanenter Link zum Eintrag.